Places you visit : Delhi, Jaipur, Jaisalmer, Jodhpur, Sawai Madhopur, Chittorgarh, Udaipur, Agra. Highlights : Enjoy the high royal hospitality of one of the top rated luxury trains of the world. Visit to historical monuments like Taj Mahal, Mehrangarh Fort, Umaid Bhawan Palace, City Palace and Amer Fort. Indulge into wildlife game viewing at famous national parks of Ranthambore and Bharatpur. The 8 day Palace On Wheels enables you to enjoy the world famous royal hospitality of Rajasthan along with exploring its several of important tourist sightseeing places. Destinations you cover in this tour include all the important tourists places of Rajasthan and other locations like Delhi and Agra. Full of cultural, historical and wildlife sightseeing along with world-class standard of hospitality, the tour offers you to indulge into most royal way of vacationing. Day 1: Delhi. Reach at Safdarjung Rly Station in evening at 4, and board on Palace On Wheel. Receive a very warm welcome. Day 2: Jaipur. Arrive Jaipur at 2 in the morning. The whole day you explore The Pink City, which includes sightseeing of its many popular historical locations, shopping and eating out at its prime attractions. Day 3: Jaisalmer. Arrive here at 8 morning. Explore this Golden City Of Rajasthan by visiting many of its forts and havelis. After lunch on board, proceed to enjoy camel safari in its Sand Dunes. Day 4: Jodhpur. At 7 morning you arrive here. Visit its popular attractions  Mehrangarh Fort, Umaid Bhawan Palace and Jashwant Thada. Before boarding on the train, you can shop items like handicrafts and embroidered textiles. Day 5: Sawai Madhopur. Arrive here sharp in the morning at 4. Drive to its world famous Ranthambore National Park. Enjoy wildlife viewing by availing elephant/jeep safari. After game viewing, board back on train, and rush to Chittorgarh by 4 in the evening. Visit to its famous forts. Day 6: Udaipur. By 8 in the morning, you reach here. Udaipur  The Lake City Of India takes you to visit many of popular destinations like Lake Pichola, City Palace, Lake Palace, Jag Mandir and Crystal Gallery. Day 7: Bharatpur-Agra. Reach Bharatpur at 6:30 in the morning, and the wonderful excursion await you here at its world famous bird sanctuary. Enjoy game viewing while enjoying birding photography. Later, board on tour. By the noon at 2:30, you reach to Agra. Visit to Taj Mahal, one of the best preserved monuments of the world. At 11 in night, train departs from Agra. Day 8: Delhi. Arrive at Safdarjung Rly Station in morning. The heightened royal touch in your hospitality marks a striking difference. 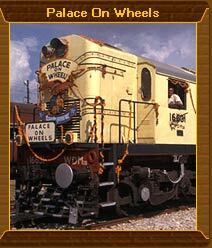 As you board onto the train, you better understand the term Palace On Wheels. Endowed with superb Rajasthani royal hospitality, the accommodation on the train let you feel transmitted to the era lived by rulers and kings of princely states of India. Visit to some of the world famous historical monuments like Taj Mahal, City Palace, Amer Fort, Umaid Bhawan Palace and Mehrangarh Fort are favourite sightseeing joy for tourists. Peeping into their historical and architectural excellence is worth bewitching. Camel safari at Jaisalmer in its world famous Sand Dunes take you to wonderland along with letting you explore local Rajasthani villages. Wildlife excursion at two of Rajasthans famous wildlife parks, Ranthambore National Park and Bharatpur National Park let you explore its rich natural heritage. Along with enjoying game viewing, you can indulge into wildlife photography, and return with some cherishing images.